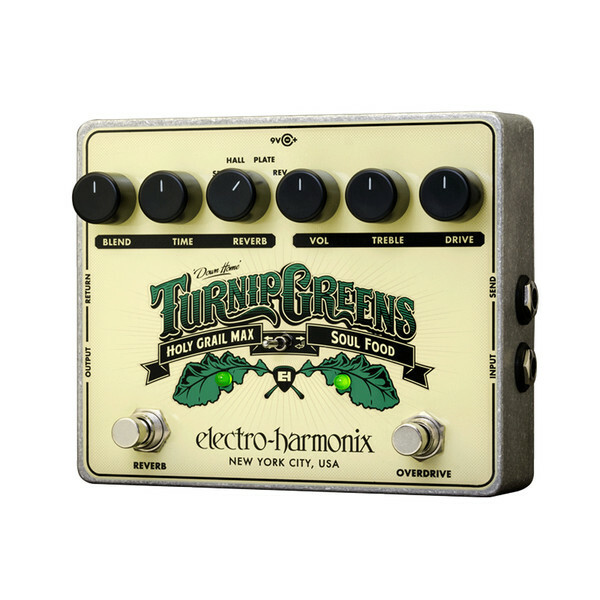 The Electro Harmonix Turnip Greens electric guitar pedal is an amazing new multi-effect pedal from Electro Harmonix which combines the award winning Soul Food Overdrive and Holy Grail Max Reverb pedal to create a unique, extremely versatile and fantastic sounding guitar pedal. Also with the built in effects loop the Turnip Greens provides the ability to add in single or multiple effects between the reverb and distortion and even switch the two effects order in the effects loop with the simple toggle switch located in the centre of the compact die cast unit to allow for even more tonal possibilities. The Soul Food Overdrive allows you to fatten your tone in all the right places without compromising or changing it whether you're seeking a clean boost or heavy amp saturation, all can be achieved without adding colouration. Controls include Volume, Treble and Drive knobs. Volume sets the output level of the Soul Food section of the pedal while drive adjusts the saturation/gain whilst the treble control allows you to seemingly pull shimmering upper harmonics out of nowhere to create your ideal tone. The Holy Grail Max section of the Turnip Greens multi-effects pedal allows you to add an array of different styles of reverb to your sound whether requiring a large arena style reverb to a small garage reverb the Holy Grail Max can do it all. Featuring 3 controls including reverb style (spring, hall, plate and reverse), time and blend you can easily and quickly create professional sounding ambience to suit any style.